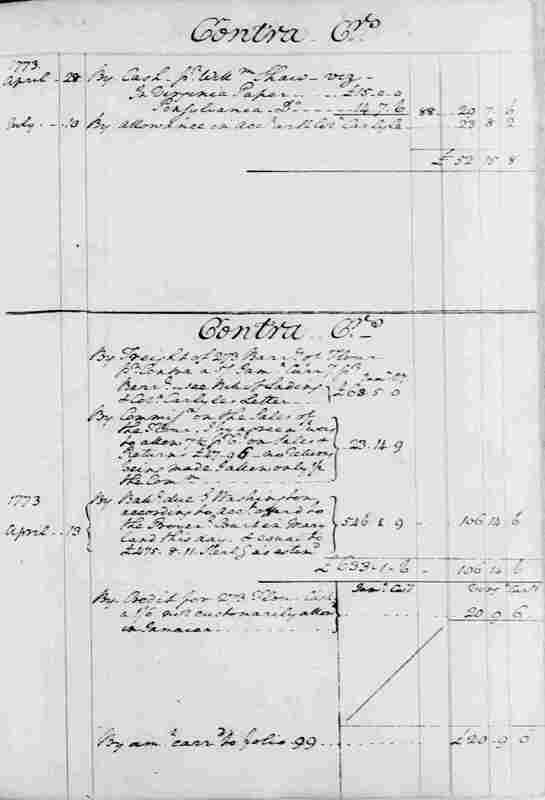 Line 9 - According to a record GW made in his account book of the state of his account against Daniel Jenifer Adams, the letter mentioned in this entry was Daniel Jenifer Adams's letter to GW of 3 Oct. 1772, which has not been found. GW wrote the following in his account book: "To 273 Barls of Suprfine Flour Consignd him in ye [the] Brig Fairfax—Saml Brodie —Master Weigg Nett 63,308 lbs.—the Sale of wch, in a Letter dated Kingston Jamaica Octr 3d 1772 he Accts for in these Words—'I have sold 220 Barls @ 20/. & the Ball. I shall sell immediately for the same price'” (GW's Account Book no. 2, 1767-1775, folio 88, DLC:GW, ser. 5). In February 1773, GW sent the above account against Adams to Robert McMickan, a merchant in Kingston, who had been involved in the sale of GW's flour. In that letter, GW complained that Adams had "never renderd" him "any regular acct of the Sales of" his flour. See GW to Robert McMickan, February 1773 [Rotunda | Founders Online | Print (Colonial Series, Volume 9, pages 188-89)]. Line 9 - "Colo. Carlyle's Letter" may refer to John Carlyle's letter to GW of 20 July 1772. 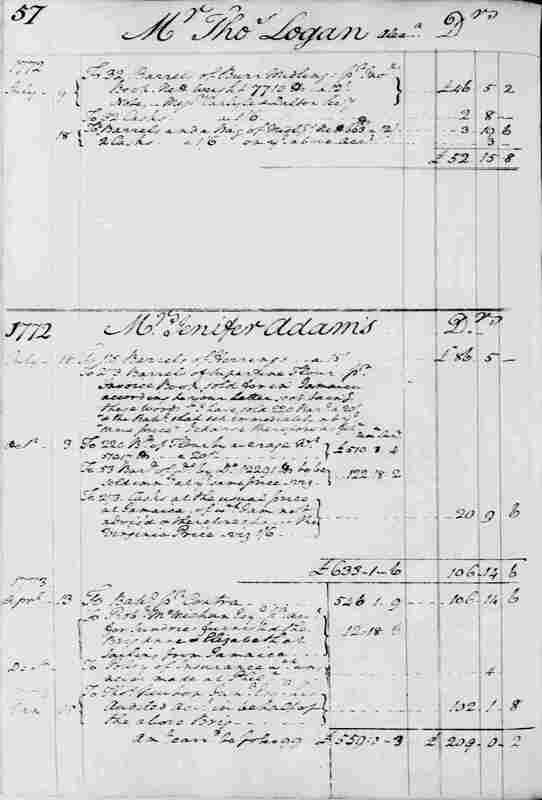 That letter concerned the joint trading venture that GW and Carlyle had with Daniel Jenifer Adams and Samuel Brodie, the captain and owner of the brig Fairfax, whereby GW had consigned to Adams 273 barrels of flour, placed aboard the Fairfax, and which Adams was to sell in the West Indies. The Alexandria firm of Carlyle & Dalton, of which John Carlyle was a partner, also consigned flour to both Adams and Brodie. On 28 June 1772, Carlyle wrote Lund Washington ensuring him that GW would have "Freight for 250 or 80 barrels of flour at 5/ barrel." In his letter to GW of 20 July, Carlyle wrote again on the subject. His letter reads in part: "The Captain [Brodie] Comeing Up this Evening Surprised me & tells me You wanted bills of Lading I have filled Up Two as many as I think Necessary Without You Conssigne Yr Cargo to any person on the Iselands In that case you may Take three I have Consigned mine & Mr Daltons Interest on board to the Captain & Mr Adams Joyntly, & therefor take but Two bills of Lading the Freight I Intend is the Curruncy Of the Iseland where the Comodity is Sold & No more." Early the following year, GW discontinued business with Adams after hearing reports of the latter's dubious activities. See GW to Daniel Jenifer Adams, 20 July 1772, and n.1 [Rotunda | Founders Online | Print (Colonial Series, Volume 9, pages 69-71)]; see also John Carlyle, 20 July 1772, and n.3 [Rotunda | Founders Online | Print (Colonial Series, Volume 9, pages 71-72)]. To 53 Barls of Do by Do 12291 lbs. to be sold immly at ye [the] same price viz. To Policy of Insurance wch was never made at Phila. By Cash pr Willm Shaw viz.